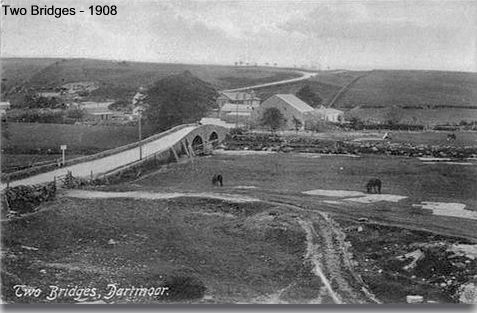 “Two Bridges is on the Dart, and is about the middle of this wild uncultivated district; a more dreary situation in winter cannot be imagined in the centre of so rich, populous, and cultivated a county as Devonshire; no wood is to be seen, and the little stock, an apology for a farm, around the inn, evinces the difficulty attendant on such an experiment” – T. H. Williams, 1827. As can be gleaned from the above, at one time Two Bridges was not the most hospitable of places and sitting at around 340m winters were/are no fun. The first documented record of the place-name – Two Bridges was in 1573 when it appeared in a court roll as Tobrygge. This has been taken to mean ‘at the bridge’ as the word ‘to’ is a Devonshire term for ‘at’, as in where’s ee to? This then later became mutated to the word ‘two’, Glover et al. p.197. Originally this area would have been where an old trans-Dartmoor packhorse track crossed both the Cowsic and West Dart rivers, as can be seen from Donn’s map below. But these crossing points were not where the two bridges are located today they were further to the north and both would have been clapper bridges. Hemery, p.458, suggested that the clapper bridge pertaining to the place-name, Tobrygge was one now long gone and was situated between Crockern Farm and Cowsic Foot. In his opinion these two clappers would have been too far apart to be called ‘Two Bridges‘, hence returning the the original interpretation of the place-name. He also notes that a local moorman informed him that this clapper was washed away sometime in the early 1800s? The first bridge to appear at Two Bridges was one that carried the turnpike road across the West Dart just below the confluence with the Cowsic which tends to make sense, one crossing instead of two. The second bridge, known as the ‘Prince Edward Bridge’, began construction in 1931 and completed in 1932 superseded the old turnpike bridge, finally becoming Two Bridges. 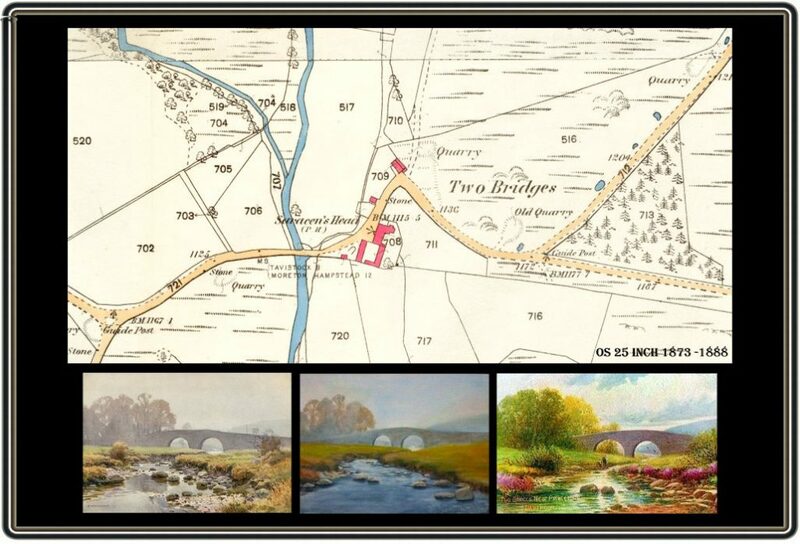 The postcard below is dated around 1908 and clearly shows the old turnpike bridge before the new county bridge was constructed. You can see what appears to be gates hanging across the arches ? However the whole idea of these gates also known as spanions was to prevent livestock wandering between commons and newtakes, many thanks to Simon Butcher for pointing this out. A similar example of this can be seen at the Cherry Brook bridge. The other entry of interest on Donn’s map is that of a ‘Potato Market’, this would have been an open-air market where potato growers from the Chagford and Moretonhampstead area brought their produce to be sold. The location of this venue could not have been better situated as it gave both producers and buyers access to a convenient convergence of roads, the market appears to have been at its peak around about 1770. As with any crossing point of major routes it was an ideal place to pick up some passing trade in the form of travellers looking for food and/or shelter. Add to this the fact that the potato market was also situated there then you have even more opportunities to make some money. Therefore it comes as no surprise that an inn was built there to service all the passers-bys needs, although it’s more than likely this was just a very basic establishment. In 1792 Sir Frances Buller of nearby Prince Hall did a ‘proper job’ and formally built an inn called the ‘Saracen’s Head’. One may wonder why a Dartmoor inn should be given such a name and the answer is simple, a Saracens head appeared on his family crest. Hemery, p.458. Gradually the inn became established with many types of travellers and those looking for refreshment although it seems the place would not get many recommendations on Trip Adviser today. The Reverend John Swete wrote of a visit he made to the Saracen’s Head in 1797, he noted: “On the public road the little inn had been a few years ago erected by Sir Francis Buller for the accommodation of the traveller on the moor. The spot was most judiciously selected, being nearly at the junction of the several roads, proceeding from Plymouth, Tavistoke (sic) Ashburton, and Moretonhampstead, and at a central stage as it were from them all.”, p.49. In 1803 the inn had changed its status to ‘The Saracen’s Head Hotel but sadly things were not living up to expextations by the mid 1800s the Saracen’s Head was not receiving too many recommendations and there are numerous accounts written by topographers stating how dire the place was, below is but one example: “Now having been right regally entertained at the Red Lion at Ashburton… do not imagine that a similar reception awaits you at the “Two Bridges.” If you have any fear of what is termed roughing it, turn back from whence you came. At all events, you will have visited a portion of your native country unknown to thousands of your countrymen who have been up the Rhine and down the Nile…“, The Ladies Companion, 1860. However, you cant’ please everybody and in a diary from one gentleman’s stay at the hotel things had, dramatically changed – see HERE. Hemery gives a list of a few of the owners and landlords of the inn; John Pooke (owner – 1827), Peter Chaffe (host – 1827), John Hamlyn (landlord – 1840), and Henry Trinman (owner – 1903), H. J. Powell (owner 1912). Around the early 1900s the hotel finally changed to it’s current name – the Two Bridges Hotel when it was in the ownership of the Allanson family, p.459. 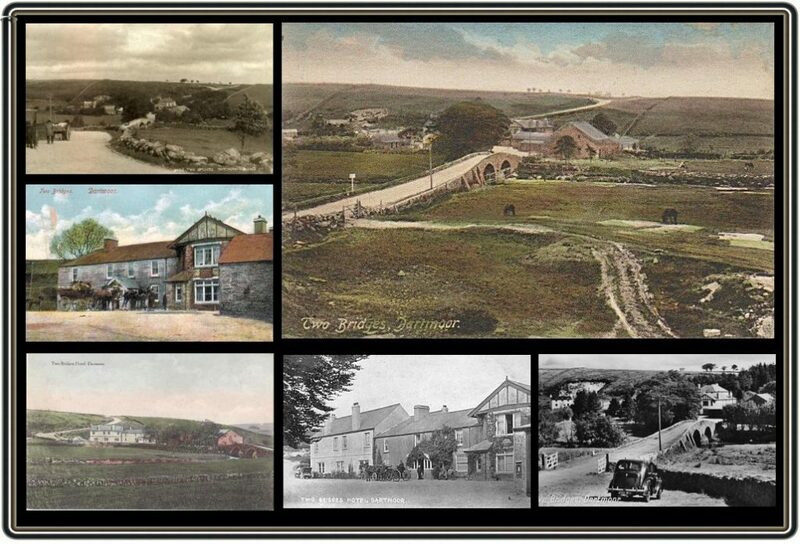 From the late eighteen hundreds there was a huge increase in people visiting Dartmoor and to cater for this numerous Charabanc trips were established. At first horse drawn vehicles were used to convey the trippers and later the motor vehicles took over. 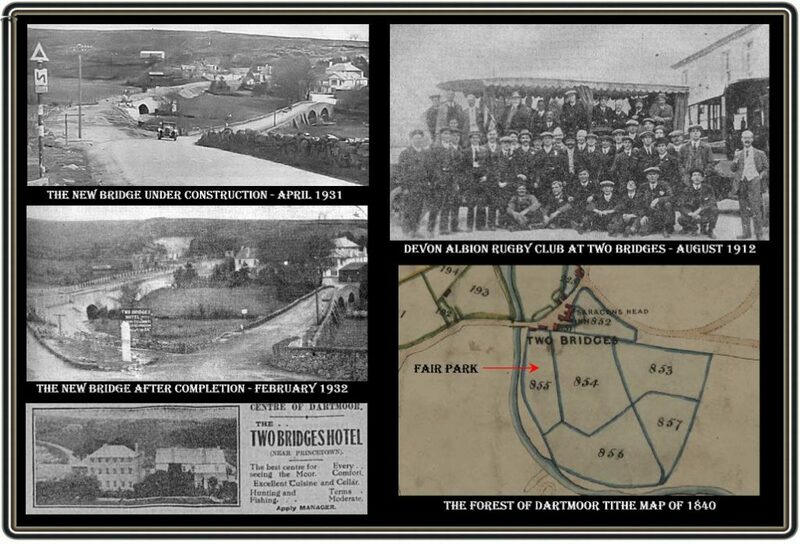 The two Bridges Hotel was a convenient stop over where the passengers could avail themselves of refreshment, in the photo below you can see one such party visiting the hotel In 1907 the Devonia handbook carried the follow advert for Two Bridges: “Two Bridges. This is a very favourite resort for fishermen who love the Dartmoor streams, and for those who desire to get the invigorating influences of Dartmoor air, than which nothing is more restorative. The railway station for Two Bridges is Princetown, Great Western Railway, about a mile or so away. It may be reached also by coach from Totnes and Moretonhampstead, by a very beautiful drive across Dartmoor in either case. The district is a fine one for a quiet recuperative holiday and is the scene of many traditions and stories.” One famous Dartmoor author that used to frequent the hotel was Eden Phillpotts along with his secretary. A fictitious name that he gave to the hotel was the ‘Ring O’ Bells’ which appears in several of his novels, such as ‘The Thief of Virtue’ and ‘The Farm of the Dagger’, the short extract below comes from his novel ‘The River’. “Where now stands the best hostelry on Dartmoor, at Two Bridges, nigh Princetown, there existed in the past a little tavern known as the ” Ring o’ Bells.” It scarcely deserved the name of inn, and was indeed no more than a drinking-house for the moor-men and a place where horses might be baited upon their way.”, Eden Phillpotts, The River. During the height of WWII the hotel became a preparatory school, it was at the time when there was a real threat of invasion and many folk were moved out of harms way. Amongst this evacuation was a preparatory school from Seafield in East Sussex which took up residence at the Two Bridges hotel, MacDonnell, pp 12 -13. William Crossing mentions that a fair was regularly held at Two Bridges which was followed by a sports day. He recounts a visit when there were some Devon wrestling matches taking place a couple of days after the fair,1974, p.68. Gerrish, p.28 tells us that by 1822 the Two Bridges fair was held on the Wednesday following the 16th of August when cattle, sheep and horses were sold. As can be seen above, the Tithe Map and Apportionment for 1840 clearly shows the enclosure number 855 a which is called ‘Fair Park’. The fair day later moved to a Thursday early in August. In Owens’ publication – ‘Book of New Fairs’ which was published in 1816 there is no mention of the fair at Two Bridges so it may well be that it began shortly after then? Crossing in another book states that the Two Bridges fair was replaced by the one held at nearby Princetown but sadly he makes no mention of when, 1977, p.126. Not only was it travellers that would use the inn, the area is well know for its good fishing and hunting and so it became a popular centre for hunters and their dogs, horses etc. Hemery, p.459, records how at one time there was a blacksmith’s shop at the inn who serviced customers and any passing travellers whose horse/pony had thrown a shoe. Back in the late 1980s I used to stay at the hotel quite a bit and I remember one very late winter’s night being awoken by a mad scratching and scrabbling noise coming from under the bed. The room was in complete darkness with a definite chill, I turned on the light and peered under the bed where a found the hotel cat. This explained the eerie noises and a quick glance over to the window explained the chill, the sash window had slipped open and the freezing moor air was wafting in. Around about the same time the hotel then had a small public bar and to this day I can still recall sitting in there and enjoying a pint or two after a day spent on the moor. It must have been about the same time when we once spent a disastrous New Year’s Day afternoon at the hotel, eating cream teas (as if that’s the very thing you need after all the Christmas feasting) and playing cards. The next occasion I had the pleasure of staying at the hotel was back in 2009 during some filming I did for the History Channel. The whole crew were in residence and the film company were picking up my tab. It was a most comfortable stay with good food, the only disappointment was that I thought ‘film stars?’ when on expenses were allowed a limitless bar tab – this one extended to two pints :(. My most recent stay at the hotel was rather different as I enjoyed an evening meal in the company of William Crossing and his wife along with various other long departed Dartmoor celebrities – see HERE. Once recent claim to fame for the hotel is that they have a resident film star of their own, a goose called Gideon who starred in Spielberg’s Warhorse film. Apparently some of his film crew were staying at the hotel and were taken by his star quality. Crossing W. 1974. Crossing’s Amid Devonia’s Alps. Newton Abbot: David & Charles. Crossing. W. 1977. Folklore and Legends of Dartmoor. Liverton: Forest Publishing. Gerrish, T. 2001. Old Dartmoor Fairs – The Dartmoor Magazine No.62. Brixham: Quay Publications. Gover, J.E.B., Mawer, A., & Stenton, F. M. 1992 Place-Names of Devon. Nottingham: The English Place Name Society. MacDonnell, R. 1993. A Dartmoor Education – The Dartmoor Magazine – No.32. Brixham: Quay Publications. Swete, J. Rev. (Ed. M. Rowe). 2000. Travels in Georgian Devon. Tiverton: Halsgrove. Hi, I’ve been researching my Devon Drakes, and note that there was a miller called Charles Robjohns, employing 3 men who married Elizabeth Drake and lived at Twobridges in the 1851 census. Hence, I presume that there was a mill on one of the rivers, but I can’t see a mention of it. It is on the Tavistock records so I presume that it is the right place? Did the mill disappear?